BROWNSBURG, Ind. (WXIN) – A former Brownsburg High School student was arrested Tuesday on federal terrorism charges after allegedly attempting to provide support to ISIS and travel overseas to join the terrorism organization. FBI agents and Brownsburg police officers first showed up Brownsburg Pointe Apartments, located off of Whittington Drive, shortly after 2 p.m.
Officials said Akram Musleh, 18, attempted to board a bus from Indianapolis to New York, where they say he planned to fly to Morocco on his way to territory controlled by ISIS. Court documents say he then planned to join the group. We commend the FBI and law enforcement officers at every level in this state for the efforts that led to the apprehension of a radicalized Brownsburg teenager who was attempting to join terrorist forces in the Middle East. The apprehension of this suspect is an example of collaboration at the highest level of law enforcement and because of these actions, there is no doubt that Indiana is a safer place. While every Hoosier should draw comfort from this successful effort by our law enforcement community, we must not lose sight of that fact that, in light of the most recent terrorist attacks in Orlando and San Bernardino, no community is immune from this new threat. In these challenging times, it is essential that all Hoosiers exercise vigilance and report any suspicious activities to the appropriate law enforcement authorities. In short, if you see something say something. Officials say YouTube videos of Anwar Al-Awlaki posted by Musleh were first discovered in August 2013. 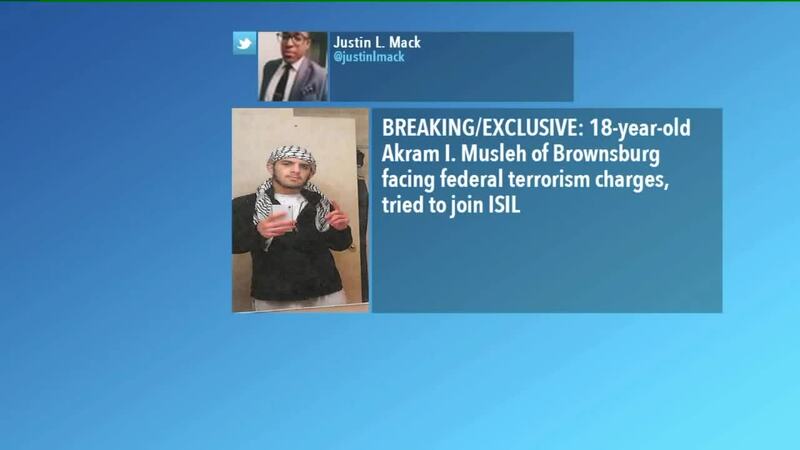 The FBI discovered after finding the videos that Musleh was a student at Brownsburg High School. The FBI met with school officials and Musleh a the school on December 11, 2013. He told them that a close family member introduced him to such videos, which he would watch at home, according to court documents. He said he used the videos to "further his understanding of the history of Islam." Court documents show the school and the FBI took steps to dissuade Musleh from engaging in radical extremism. Islamic State fighters are seen inside a vehicle in Iraq, in this still image taken from an amateur video supplied by Kurdish Peshmerga and received by Reuters on April 29, 2016. Amateur video/via REUTERS TV ?ATTENTION EDITORS - THIS IMAGE WAS PROVIDED BY A THIRD PARTY. REUTERS IS UNABLE TO INDEPENDENTLY VERIFY THE AUTHENTICITY, CONTENT, LOCATION OR DATE OF THIS IMAGE. EDITORIAL USE ONLY. NO RESALES. NO ARCHIVE. An armoured Islamic State vehicle is hit in Iraq, in this still image taken from an amateur video supplied by Kurdish Peshmerga and received by Reuters on April 29, 2016. Amateur video/via REUTERS TV ?ATTENTION EDITORS - THIS IMAGE WAS PROVIDED BY A THIRD PARTY. REUTERS IS UNABLE TO INDEPENDENTLY VERIFY THE AUTHENTICITY, CONTENT, LOCATION OR DATE OF THIS IMAGE. EDITORIAL USE ONLY. NO RESALES. NO ARCHIVE. A man in an armoured vehicle, said to be a suicide bomber about to go out on a mission, talks to other Islamic State fighters in Iraq, in this still image taken from an amateur video supplied by Kurdish Peshmerga and received by Reuters on April 29, 2016. Amateur video/via REUTERS TV ATTENTION EDITORS - THIS IMAGE WAS PROVIDED BY A THIRD PARTY. REUTERS IS UNABLE TO INDEPENDENTLY VERIFY THE AUTHENTICITY, CONTENT, LOCATION OR DATE OF THIS IMAGE. EDITORIAL USE ONLY. NO RESALES. NO ARCHIVE. Nine months later, Musleh reportedly purchased an ISIS flag online. On or around June 17, 2015, he photographed himself in front of it. If convicted, Musleh faces 20 years in prison, a lifetime of supervised release and a $250,000 fine. "Terrorism is the FBI's number one priority and we work closely with our law enforcement partners to ensure the safety of our community," said FBI Special Agent in Charge W. Jay Abbott of the FBI's Indiana division. "This case demonstrates the value of law enforcement collaboration and community engagement." On April 12, 2015, Brownsburg police investigated an incident in Williams Park after a report of juveniles being asked if they wanted to join Daesh, another term for ISIS. The FBI determined Musleh was one of the people asking these questions. Court documents show that in April 2015, Musleh purchased a one-way ticket from Chicago to Erbil, Iraq. He did not end up taking the flight. In May 2015, Musleh purchased a one-way ticket from Chicago to Istanbul, Turkey. The credit card used to book the flight was declined and he didn't take the flight. In June 2015, he book at least three separate one-way tickets from Chicago to Istanbul, Turkey. He arrived at the airport on June 23, 2015, and obtained his boarding pass. He was interviewed by U.S. Customs and Border Protection. He told them he was traveling to Istanbul to see family and friends. A short time later, he said he was traveling to get married and would be meeting his fiancee and her family upon arrival. FBI investigators were not aware of any family or friends he had in Turkey. Investigators did learn the alleged fiancee is an ISIS sympathizer who resided in Sweden. A member of the peshmerga forces inspects a tunnel used by Islamic State militants in the town of Sinjar, Iraq December 1, 2015. Picture taken December 1, 2015. REUTERS/Ari Jalal FOR EDITORIAL USE ONLY. NO RESALES. NO ARCHIVE. A tunnel used by Islamic State militants is seen in the town of Sinjar, Iraq December 1, 2015. Picture taken December 1, 2015. REUTERS/Ari Jalal FOR EDITORIAL USE ONLY. NO RESALES. NO ARCHIVE. Authorities informed Musleh he could not travel to Turkey on his passport because it was set to expire on August 25, 2015. Turkey requires a minimum of six months of validity on passports. His baggage was searched and the FBI found a journal with quotes from Abu Musab Zarqawi, Abdullah Azzam, Anwar AL-Awlaki and Osama Bin Laden, all individuals who are or have been associated with terrorist organizations. Officials said Turkey is a common transit point to gain entry to ISIS territory in Syria. On May 2, 2016, Musleh viewed an article from 2006 discussing a Indiana Department of Homeland Security list of approximately 8,500 potential terror targets in Indiana. Three days later, Musleh accessed sites looking at pressure cookers. He also did extensive research on May 6-7 on explosive materials, including: dynamite, flash powder, explosive precursors, instructions on constructing explosive devices and explosive chemical recipes. Court documents say Musleh used social media to indicate his affiliation with and support for ISIS. On an unidentified social media platform, Musleh spoke with another user indicating his desire to join ISIS. He reminds the user who he is and said he and his brother spoke with the user previously. Musley indicates his passport is renewed and he has money, but the user says the time is not right and urges patience. Instead of traveling to join ISIS, the user suggests he travel to Florida to carry out an attack on U.S. military members. Musleh then goes on to have conversations with other users regarding attempting to travel to join ISIS. He also expressed his desire to be in an ISIS propaganda video. ISIS propaganda was also posted Musleh's social media accounts, according to court documents. On May 16, 2016, an FBI confidential human source (CHS) reached out to Musleh on social media and began speaking with him on an online messaging platform. Court documents show Musleh expressed his desire again to travel in order to join ISIS in either Syria or Lybia. During one of these conversations, investigators say he pledged his allegiance to ISIS. Throughout the course of the conversations, propaganda is exchanged and potential routes into ISIS territory are discussed. On May 25, 2016, FBI agents searched Musleh's cell phone in Brownsburg. According to court documents, agents recovered many files about jihad, martyrdom and ISIS. Several ISIS-produced magazines were also reportedly found on the phone, along with photos of him allegedly using ISIS hand gestures. On June 1, 2016, court documents show Musleh began speaking to a person on a messaging system once again about traveling to join ISIS. The user tells him the platform they are on isn't safe to use. Two days later, Musleh received an email notification indicating he had booked a one-way ticket from Casablanca, Morocco to New York, New York. The departure was set for July 21. On June 21, FBI agents say Musleh enter the Greyhound bus station in Indianapolis. He was arrested after purchasing a bus ticket.